No trip to Northland would be complete without a visit to Waipoua Forest and ours was no different. Seeing Tāne Mahuta, the largest living kauri tree in New Zealand, had been on my bucket list for a while, but two kilometres further down the road we found three tracks that for my money are just as, if not more, spectacular. The turn-off is signposted simply as “kauri walks” but the tracks here provide access to more kauri trees than I knew still existed in New Zealand. All the tracks come off the same central path so you can do all of them in about two hours. Otherwise take your pick from 20 minutes to 1 hour 20 minutes return. First up was the walk to the tree named Yakas, named after gum digger called Nick Yakas. 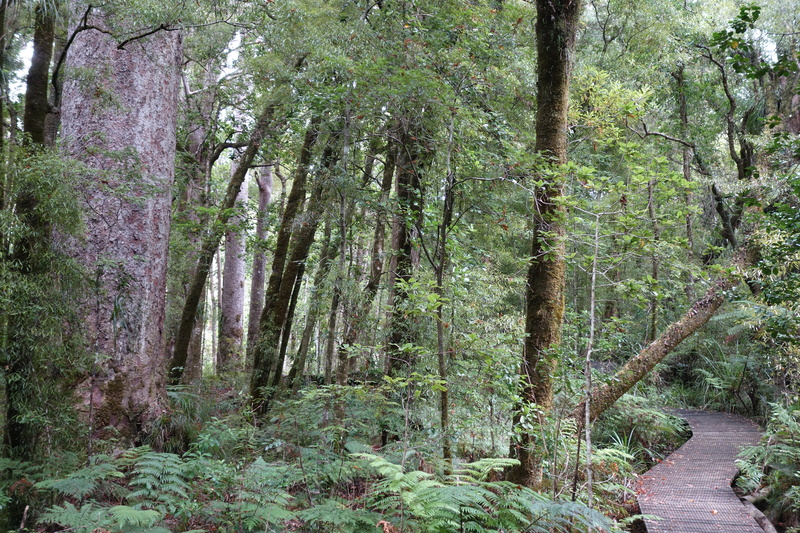 The track passes through beautiful kauri forest. It then gets so close to Yakas you can really feel its enormity (you can’t get as close to Tāne Mahuta). 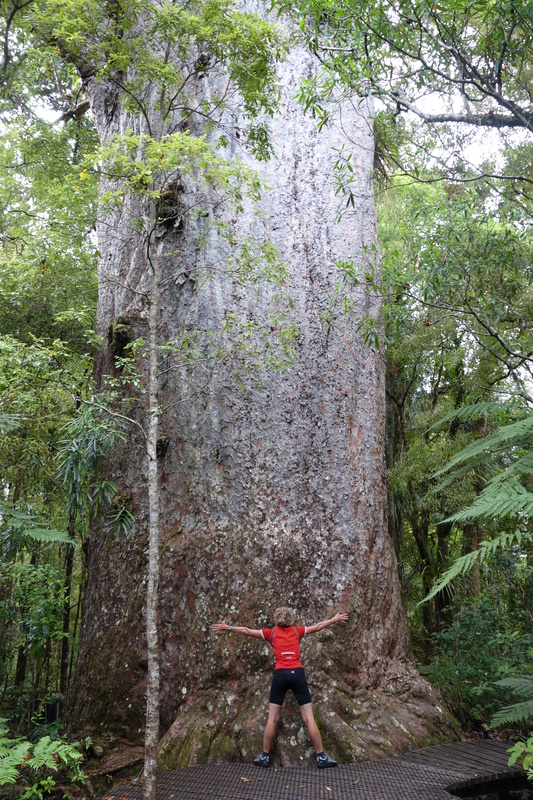 It seemed somehow unkind for the sign to describe the tree as “the seventh largest kauri tree” – it seemed pretty big to me. Next up was Four Sisters – four trees that are very close together. The boardwalk circles the cluster, giving you get a good view from all angles. 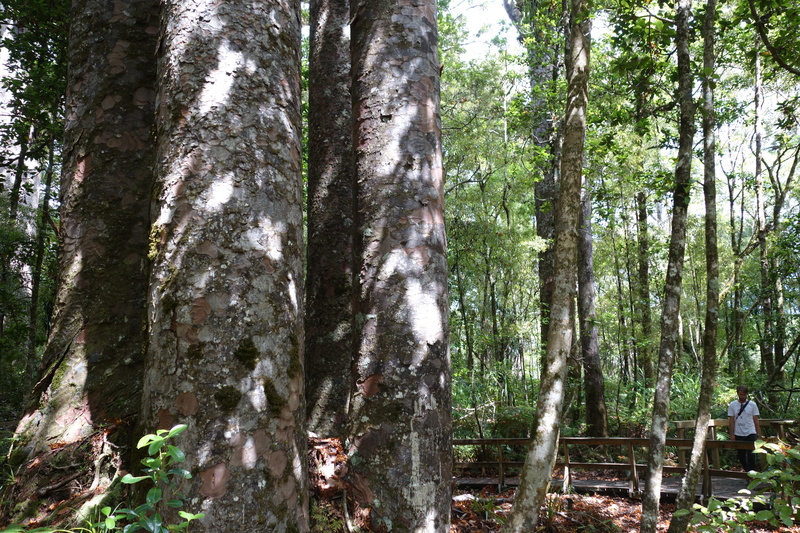 Then onto Te Matua Ngahere – Father of the Forest. The forest is similar to the other tracks until you turn a corner and come head on with the second largest living kauri tree in New Zealand. The road through Waipoua Forest is 18 kilometres long and kauri trees are visible along some of it. 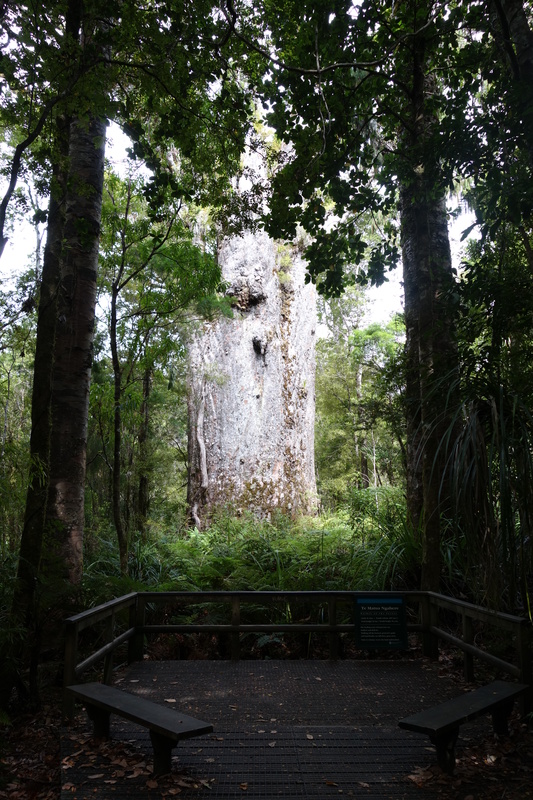 If you’re planning a trip to the area, visit Tāne Mahuta for sure, but make sure to allow enough time to enjoy the journey, as well as stop to admire the other “giants of the forests”. I’ve been in the Hokianga nearly 40 years – the forest never ceases to be awe-inspiring. We’re just around the bend .. at Waiotemarama Falls Lodge .. and the wonderful Kauri Bush walk in the Waima State Forest. Look us up! We love Waiotemarama too! The Waiotemarama Loop Track, the wonderful Waiotemarama waterfall, the beautiful bush… you’re very fortunate to live in the area. Thanks for commenting. Fantastic, this is on my list of must do’s. Thanks for sharing.